Apple took a big leap ahead of competing PC makers Monday introducing a new 15-inch MacBook Pro with Retina display that borrows from the design concepts of the MacBook Air. The new laptop isn't cheap, but for its class it is very thin (0.71 inches) and light (4.46 pounds) thanks to losing the optical drive, FireWire port, Ethernet jack, and offering nothing but flash storage. Putting this device over the top, however, is its impressive new LED-backlit display with 2880-by-1800 resolution at 220 pixels per inch. Critics have long expected Apple to merge the Air with its MacBook lineup and that process begins now. 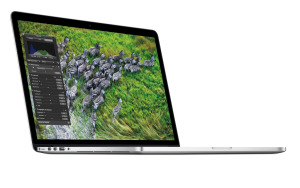 Apple called the new MacBook Pro with Retina display its next-generation MacBook Pro. That said, can Apple's new Retina MacBook Pro rain on the PC laptop or Intel's Ultrabook parade? Or will Apple, once again, inspire another flood of PC clones as it did with the MacBook Air and the ensuing Ultrabook onslaught. For the moment, this next-generation laptop is not going to appeal to the current generation of laptop buyers - be it PC or Apple. The base model alone for the new MBP is priced at $2200 for just 256GB of hard drive space and a quad-core 2.3 GHz Core i7 processor. 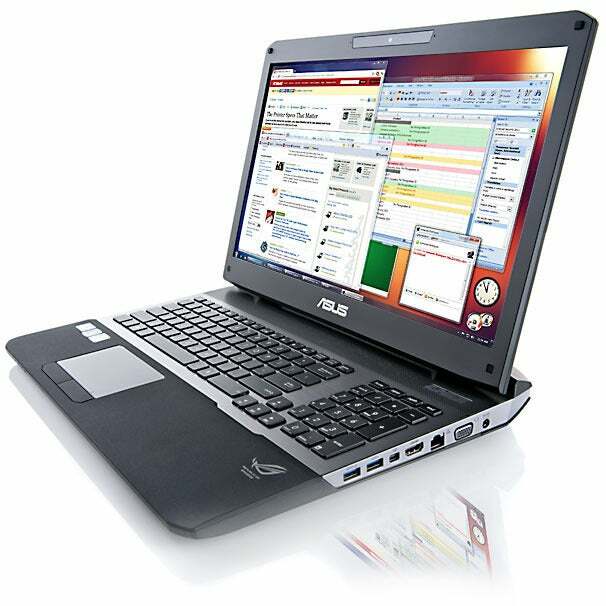 Compare that to the $1500 Asus G75VW gaming laptop featuring the same processor, six times the storage space (hard drive, not flash), and a 17-inch screen with 1920-by-1080 resolution. Sure, Apple will sell a bunch of Retina MBPs, but for the most part this laptop is meant for people to salivate over in the Apple Store, not to buy en masse. In that respect, the new MacBook Pro is like the original MacBookAir from early 2008. The Air was priced too high for most people at $1700 and the laptop's poor specs didn't help matters either. But people were intrigued with the idea of traveling with a laptop that was so thin it could hide inside a manila envelope. Over time Apple bumped up the specs, improved the device, and then watched the Air’s popularity explode in 2011 after introducing moremoderatelypriced 11- and 13-inchmodels. You can bet Apple wants to relive the Air’s trajectory with the new MacBook Pro, except this time better priced Apple laptops could appear in less than the three years it took for the Air. That’s because the specs on the new MacBook Pro are already good, so it’s mostly a matter of reducing production and supply costs. Beyond the quad-core i7 processor and the killer display, the base model of Apple’s new laptop features 8GB RAM (up to 16GB maximum), NVIDIA GeForce GT 650M with 1GB of GDDR5 memory, 720p Webcam, 2 x USB 3.0, Thunderbolt, SDXC card slot, 802.11n Wi-Fi, Bluetooth 4.0, and up to 7 hours battery life. I’d like to see better battery life and more storage, and the device’s 4.46-pound weight is still too close to 5 pounds for my liking, but that’s about it. The company will probably let the new laptop live outside the regular MacBook Pro line for a few iterations as the laptop improves in price and specs. But sooner or later more MacBook models will adopt these specs and at lower prices. Now that Apple has taken the wraps off its next-generation device, where does that leave the rest of the PC industry? Ultrabooks and other Windows-based laptops headed your way in the coming months are bound to be interesting once Microsoft releases the touch-friendly Windows 8, expected in October. We should see more touchscreens on laptops, more convertible laptops, and touchpads enhanced with more gestures for the Windows 8 Metro UI. But adapting for touch won't be enough. Hopefully, computer manufacturers will look at Apple’s new MacBook Pro and realize that Ultrabooks alone just won’t cut it. Intel’s Ultrabook class of laptops are supposed to merge the benefits of tablet computing (fast start-up times, thin and light) with Windows-based laptops (powerful processors, full-sized keyboards). Those same design concepts being applied to Ultrabooks should be applied across the entire range of Windows laptops. Apple appears to be headed towards an entire line of MacBook Air-like laptops that offer crisp Retina displays, are thin and light, and come loaded with flash storage. To keep pace, Windows laptop makers should start thinking along similar lines.